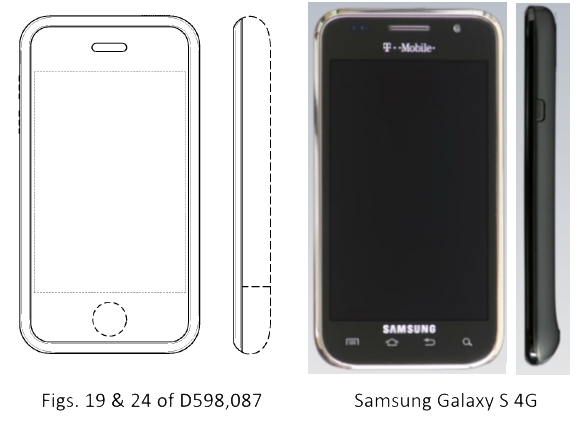 The Samsung Galaxy S 4G smartphone on the right has a different back shape and lacks a circular home button on the front as compared to the iPhone in Figures 19 and 24 of U.S. Patent No. D593087 (“the ‘087 patent”), shown on the left. But a jury determined that the Galaxy infringed the ‘087 patent in the case of Apple v. Samsung, No. 200-cv-01846 (N.D. Cal. 2011). Did the jury ignore those different elements of the Galaxy phone? Yes. And they were right to ignore them. Apple drafted the ‘087 patent in a way that requires that the differences in the back shape and the home button be ignored. Apple did that by providing those features in broken lines. The solid lines indicate the part of design of the iPhone that Apple claimed, which include rounded rectangular bezel and the phone speaker opening on the front face. If Apple would have shown all sides and all features of the iPhone in solid lines in the ‘087 patent, then it is possible that the jury would have determined that the Galaxy did not infringe the ‘087 patent. If Apple provided all sides and all features of the iPhone in solid lines in the ‘087 patent, could the jury have found the differences in the Galaxy phone, including the back shape and the lack of a home button, were enough to prevent the ordinary observer being deceived to purchase the Galaxy supposing it was the iPhone? Maybe so. Even if not, it would have made Apple’s case harder to prove. Before drafting design patent drawings, first determine which features are important and which features are not important or are less important. In figure 19 of the ‘087 patent, Apple determined the unique and important features to protect were the rounded rectangular bezel and the phone speaker opening on the front face. Apple provided the other features, the back/side shape and the home button, in broken lines. It is common for the back or bottom of a product to be less important, especially if the back or bottom is not regularly seen by customers or users. Less important or unimportant features can be shown in broken lines so that those features do not limit your design patent rights. The strategic use of broken lines for unimportant or less important features in a design patent can allow you to focus the patent protection on the important portions of your product. By focusing on those important portions, you can achieve broader design patent protection. Broader design patent protection will protect against competitors introducing designs that copy your important features but modify unimportant features to avoid your design patent. In the Apple case, Samsung was unable to avoid the ‘087 patent by making changes to the shape of the back, while providing a similar front bezel and flat face.